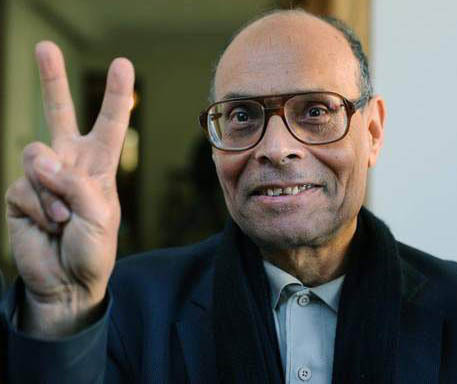 Moncef Marzouki became the first democratically elected president of Tunisia, a north African country. He was the former opposition leader there. This democratic movement was follwing an uprising that sparked similar movements in other Arab states, named the Arab Spring. Moncef Marzouki of the Congress for the Republic Party became interim president with 153 out of 217 votes in the assembly. 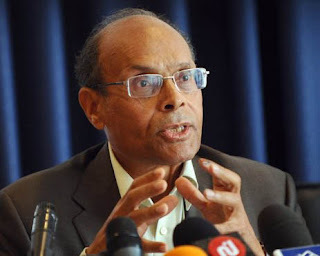 Marzouki for years struggled against Tunisia's dictator President Zine El Abidine Ben Ali and was imprisoned in 1994 for attempting to run against him as president. The new bylaws give most of the power to the prime minister, as opposed to the president under the old system - a change that worries the opposition. The bylaws also stipulate that the president must be Muslim with Tunisian parents, over 35 and not a dual citizen of another country. Tunisia is 98 percent Muslim, but has some Jewish and Christian citizens. Tunisia’s economy relies heavily on tourism, which has been driven away by post-revolutionary unrest; the phosphates industry, which has been ravaged by labor strike; and exports to Europe, which is undergoing an economic crisis of its own. Marzouki, who succeeds interim President Fouad Mebazzaa, will be Tunisia's fourth president since its independence from France in 1956, and headed the Tunisian League for the Defence of Human Rights (LTDH) from 1989 until Ben Ali supporters who forced him out in 1994, has a deep-seated passion for human rights.